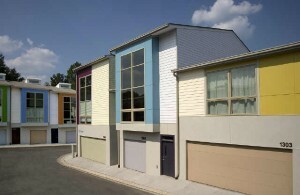 MWest Townhomes are located in Midtown West, off of Marietta Blvd and Huff Road. The community was built in two phases (2005 and 2007) and was a pioneer of sorts in offering residential living in the West Midtown area. The area has since seen almost an explosion of development from retail to residential around M West. The design of the community, from the style of the townhomes to the names of the street, have a distinct modern feeling. The homes feature private garages (1 or 2 car depending on floor plan) and most homes have a small, fenced yard or courtyard area. Residents of M West Townhomes have easy access to shopping and dining at Atlantic Station as well as the Westside Market Place and White Provisions. Visit our community page @ M West to learn more about this Midtown Atlanta condominium building, view pictures of various homes and search for homes for sale. If you are looking to buy or sell in M West Townhomes, understanding the market trends will better help you make an offer on a home for sale, or determine your pricing strategy if you are selling your M West Townhome. Data last updated: 4/19/19 8:36 PM PDT. If you are looking to Buy or Sell a home at M West Townhomes, MyMidtownMojo can help! Selling: Do you want to sell your M West Townhome? Call us today at 770.713.1505 to schedule your free market analysis of your home. Or you can complete our Seller Information Form. Are you “upside down” or owe more than your home is worth? If you need to sell your home, you have other options besides a foreclosure, such as short selling your M West Townhome. Buying: Are you looking to buy an M West Townhome? We can search for you, and even build you a custom website that will alert you daily of any new listings in the building. Just complete our Buyer Information Form and we’ll get to work!